Senate leaders failed to get the votes needed to bring up their state budget plan for 2012-13 Tuesday. In order to bring up the proposal, they need two-thirds of the Senate voting for the bill. To help get the votes, Sen. Steve Ogden (R-Bryan) took out a controversial provision that would tap the Rainy Day Fund for another $3 billion. To replace this money, Senator Ogden proposed making up the difference by bumping a $1.25 billion Medicaid payment into 2013 and enacting a 1.2 percent across-the-board cut for everything except schools and debt service. Senate leaders said they would add the money back into Medicaid if the state produces more revenue next year. This move still didn’t help muster the votes needed. However, the Senate plans to revise its rules today requiring only a simple majority to hear the bill. The budget bill then can be debated with only 16 senators voting in favor. The Senate spending plan is about $12 billion higher in state and federal funds than a bare-bones House budget plan. It cuts current spending by $11 billion, or 5.9 percent. Stay tuned. Thanks to all the physicians, medical students, and alliance members who participated in the last 2011 First Tuesday at the Capitol yesterday. TMA members spent the day visiting with state representatives and senators about legislation important to physicians and their patients. Legislators often comment that it makes a big difference when their constituents visit them in Austin. Want to learn more about the physician employment bills moving through the legislative process? TMA has a description of each bill and how it protects a physicians’ clinical autonomy on our website. House Bill 300 by Rep. Lois Kolkhorst (R-Brenham) was tentatively passed by the House. This is an attempt to strengthen state privacy law on top of the federal Health Information Portability and Accountability Act (HIPAA). The legislation would expand the entities and individuals who must comply with state privacy measures and also increases penalties for those who illegally disclose or sell data. HB 1720 by Rep. John Davis (R-Houston) received tentative approve by the House. It would improve accountability in Medicaid and the Children’s Health Insurance Program. HB 2599 by Rep. Allan Ritter (R-Nederland) also received tentative approval. It would place a tax on chewing tobacco and require better reporting of tobacco taxes. HB 123 by Rep. Marc Veasey (D-Fort Worth) was passed by the House. The legislation would create a program to educate Texas adults on the importance of proper diet, nutrition, and physical activity in the prevention and management of diabetes in counties with populations of more than 100,000. Physician workforce: HB 1380 by Rep. Vicki Truitt (R-Keller) was passed by the Senate Health and Human Services Committee Tuesday. It would allow international medical graduates to apply for licensure in Texas after two years of graduate medical education. Its companion legislation, SB 1022 by Sen. José Rodríquez (D-El Paso), is on the Senate Intent Calendar. Immunizations: The committee substitute for SB 1107 by Sen. Wendy Davis (R-Fort Worth) was approved by the House Public Health Committee yesterday. It would require all first-time students at public and private or independent colleges to receive a bacterial meningitis vaccination. Its companion legislation, HB 1816 by Rep. Charlie Howard (R-Sugar Land), was scheduled to be heard on the House floor yesterday but was delayed in order for its Senate companion to catch up. 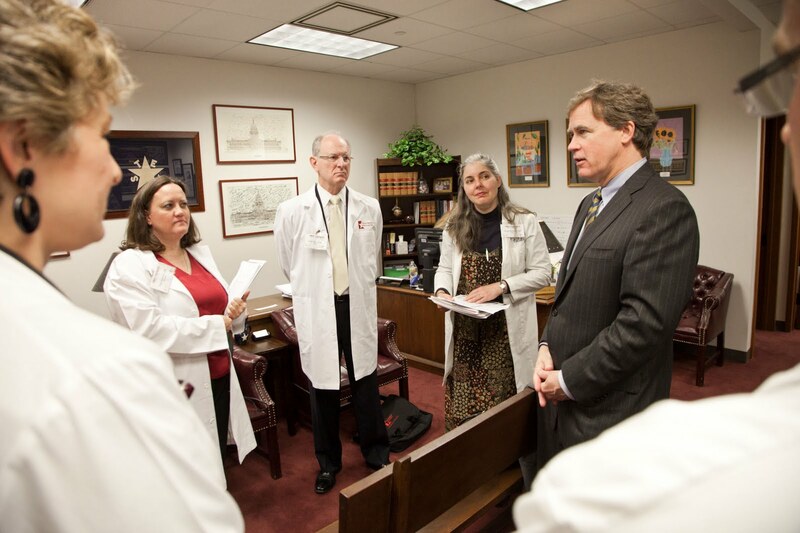 The physician of the day at the capitol is Dana Sprute, MD, of Austin. Dr. Sprute has practiced family medicine for 15 years. She graduated from The University of Texas Health Science Center at San Antonio in 1993. Dr. Sprute is a member of TMA and the Travis County Medical Society. She served as a member on TMA’s Council of Public Health and Council on Science and Public Health. Read Action: Every two weeks, TMA publishes a web edition of Action. Action presents important and timely information about legal, economic, regulatory, and legislative affairs that Texas physicians need to know. Here is the May 2 edition.